Do you need a new chicken wing recipe for dinner tonight? Learn how to make this easy baked chicken recipe free of common food allergies! This chicken recipe is a great choice for an easy and fun dinner, or for a party recipe. Do you have common food allergies? No problem see the below recipes including barbecue sauce that everyone at your party will love! Best of all it is safe for those with soy and wheat allergies. Whether you like them hot, mild, sweet or another way there is a chicken wing recipe out there for you. This recipe is on the mild side with a slight honey mustard taste. Note: Allow time for sauce to simmer, minimum 30 mins. Click to view the Mild Honey Mustard Barbecue Sauce used for this delicious and easy recipe. Want More Sauce Recipes? Click Here! Grease a baking pan with olive oil (approx. 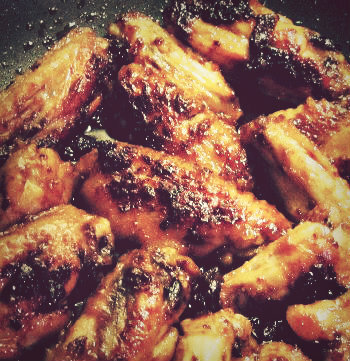 1 tbl) and with the juice of 1/2 a lemon; pour the frozen wings into the pan and mix around to evenly coat all of the wings. Place the pan in the oven and bake for 40 minutes. Check chicken wings after 40 mins. Turn wings over in pan and lightly coat with sauce (approx. 1/4 cup of sauce). Place the sauced wings back into the oven for 10 mins. Next remove the chicken wings from the oven and place them into a frying pan with a tbl of olive oil. Cooking on medium high heat, pour the remaining barbecue sauce over the wings. Fry in oil and sauce for approx. 10 mins, flip wings occasionally to evenly crisp. Did you enjoy this recipe baked chicken recipe? Looking for something for dessert? Click here to view some dessert recipes. Like this Chicken Wing Recipe? Please share with your friends!